We talk about customer evangelism as well as lessons learned from Eloqua that Jocelyn is applying today, and more! Check out the recording and transcription on the Heinz Marketing blog on Mon. 2/26/18. 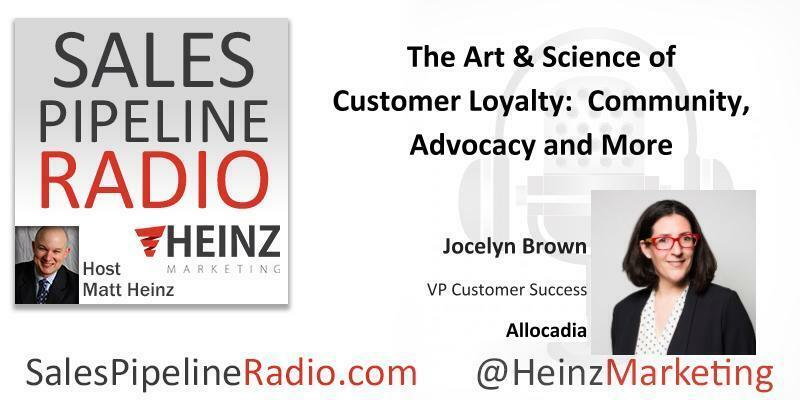 Our Guest, as VP of Customer Success at Allocadia, Jocelyn Brown is dedicated to helping Allocadia’s customers achieve the highest levels of Marketing Performance Management and maximize the business value of their investments. In her role, she guides customers through their continued growth and progression through the stages of budgeting, planning and performance excellence, and elevates their experience throughout the journey. Having spent more than 18 years in the B2B and SaaS spaces, Jocelyn brings extensive experience building and managing high-performing customer success teams that drive recurring revenue and value, and develop life-long customers. Most recently she spent 9 years at Eloqua in customer success and global market readiness roles.